- These are pages for students of Portuguese, particularly intended for those with some previous knowledge of the language or, at least, knowledge of other Latin languages. 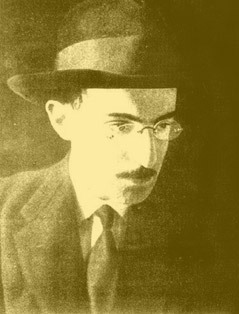 In them I present a set of poems by Fernando Pessoa. The first ones will include translations of each verse, as close as possible to the original. Whenever necessary poems will be arbitrarily divided in "stanzas" and at the left side of each you shall find links to readings by native Portuguese. Later poems will not include translations but only explanations of the poem and the meaning of some obscure terms. Finally there will be a set of poems by other poets (Portuguese and Brazilian) which will be explained, but this time only in Portuguese. In each case, the poem will be read by one or more native Portuguese, to help you perfect your own reading and understanding of the sounds. - Have fun and learn Portuguese with the poets! Mar Português is the capital short poem of Portuguese Literature and also Pessoa's best known poem in his homeland. It sums up the cost of conquering the seas in terms of suffering. Horizonte, from the Portuguese Sea cycle of Mensagem, is a beautiful and calm poem in which Pessoa muses about the fear of the unknown that was conquered by the early nauts. Gládio (Written in 1913 this beautiful poem was the very first of the set that would one day become Mensagem). Tabacaria (Pessoa's 1928 masterpiece- written as Álvaro de Campos- in which he wanders between his metaphysical thoughts and the outside reality embodied in the tobacco shop in front of his room).